GREEN DREAM: Bannockburn's James Hickleton after his team's maiden win on turf in division three. 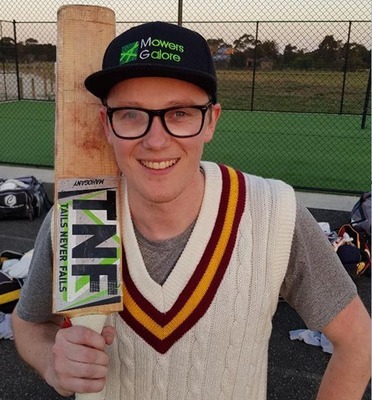 Geelong Cricket Club enjoyed a mixed bag of results last weekend, going down to St Kilda on Saturday before bouncing back with a solid win against Monash Tigers on Sunday. The Cats were bolstered by the return of Jake Reed on Saturday. Despite the star paceman returning the disappointing figures of 0/79, he’ll no doubt be better for the run. St Kilda batted first and posted 4/252, and at 3/107 in reply Geelong looked well-placed to go two from two. But a middle-order collapse left the Cats all out for just 204, Angus Boyd the only shining light with 47. On Sunday the side regrouped. Batting first, the Cats put on a very competitive 9/272, thanks mainly to Eamonn Vines (69) and Tim Ludeman (64). The Cats’ bowlers then did their job to dismiss the Tigers for 252, Brenton McDonald proving the difference with 4/44. The Cats’ next assignment is a two-day game over the next two Saturdays at Greenvale, which has yet to win a game – something Geelong will want to ensure continues. Geelong Cricket Association also reverts to the two-day format this round, and in what looms as a crucial fixture Lara hosts North Geelong as both teams wait to register a win for the season. North Geelong does have three points to its name, thanks to a round-one tie with Leopold after a game the Magpies were lucky to take anything away from after a pressure finish proved too much for Leopold. Lara, though, has lost both of its games so far, so a win here is so important if it doesn’t want to fall too far from the pack. The Cats lost by over 100 runs last week as they came up against a rampant Richie Oliver, who proved why he is one of the best in the business with an amazing 155 not-out. North Geelong didn’t fare much better, though, losing a game that was within its grasp against South Barwon. Chasing down the Swans 175, North Geelong were 6/163 and seemingly home before disaster struck as they lost 4/7 to finished five runs short. Both sides will be keen to put their first two weeks’ performance behind them and, while they both have some genuine stars in their teams, they will be looking for an even contribution from the entire 11 to ensure they snag a win before it’s too late. In division two, Murgheboluc has taken its demotion from division one in the best possible fashion, winning both games thus far. With a huge game scheduled against Bell Park this round, Murgheboluc will be looking to really show it’s going to be a force this season. The Frogs didn’t have it all their own way last round against St Peters but in the end a solid 45-run win on the back of 79 and 2/4 Michael Grozdanovski was a fitting result. On the other hand, Bell Park lowered its colours to Torquay in the grand final rematch. With both Michael and Shane Lymer unavailable, the Dragons would have hoped to prove that their much-touted depth was all that it was cracked up to be. However, the Tigers thrashed them, posting 209 batting first before making short work of a disappointing Bell Park batting line-up, all out for just 134. With the Lymers due back this week, expect a better showing, although Murgheboluc would probably prefer testing itself against the reigning premier at full strength. Selections: TORQUAY v St Peters, HIGHTON v Thomson, Bell Park v MURGHEBOLUC, MARSHALL v Manifold Heights. In division three, both Bannockburn and Teesdale would have breathed a sigh of relief last week when both clubs won their first ever games on turf after a tumultuous couple of years in the wilderness. Neither side had it their own way, though, Bannockburn having to do it the hard way against Waurn Ponds-Deakin, defending a paltry 110 by dismissing the hosts for just 73. Meanwhile over at Newcomb & District, Teesdale showed great maturity to chase down the Dinos’ 193 thanks to a superb opening stand from Jayden Brady (48) and Marcus Campbell (49). Tomorrow Teesdale hosts a turf club for the first time, with Guild Saints travelling out there in a game where the home side will be regarded as the favourite. Selections: TEESDALE v Guild Saints, GEELONG WEST v Corio, ST ALBANS BREAKWATER v Modewarre, ALEXANDER THOMSON v Waurn Ponds-Deakin, Newcomb & District v BANNOCKBURN.